Raaga.com: Death threat to Girish Karnad adds fuel to growing intolerance! 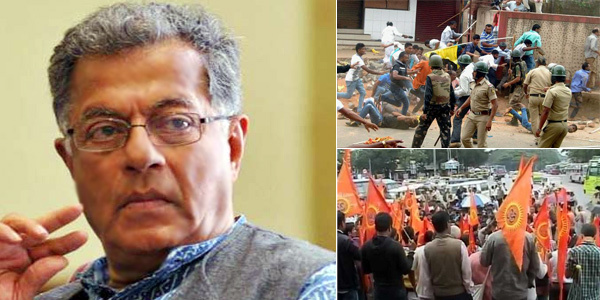 Death threat to Girish Karnad adds fuel to growing intolerance! With the nation burning on the topic of growing intolerance; the recent death threat to eminent actor / filmmaker and noted Jnanpith awardee Girish Karnad for his earnest admiration of Mysore ruler Tipu Sultan has yet again proved that the nation is surely growing intolerant! It has also raised questions on the ‘Freedom of Speech and Expressions’ of an individual being suffocated in a democratic country like India. As expected his speech did go down well with BJP, the Vishwa Hindu Parishad (VHP) and other right wing Hindu groups. Two days after the ugly controversy Girish Karnad, in an interview to a national magazine, lamented that Freedom of Expression is being suffocated today. Besides death threats to Girish Karnad, the Tipu Sultan Jayanti also witnessed violence in several parts of Karnataka against the celebrations. In Madikeri, two people also died in violent clashes. I hope Mr. Arun Jaitley and his like in the BJP would now at least not asset - "Where is intolerance? And make comments like “This country has never been and will never be intolerant."